Jerusalem-Jebus in King David’s Time. Click on map to enlarge. What did Jerusalem look like at the time of King David? When David arrived, it was more of a fortress than a city. And the fortress was called Jebus, not Jerusalem. You can see this at the bottom right of the diagram above: the little oblong was Jebus, a small walled fortress sitting on a spur of rock jutting out from the large rock plateau to its north. Why did David choose this particular rocky site for his capital? It was of no great importance to anyone, but it lay in a strategic position between two rival kingdoms: Israel in the north, ruled by Ishbaal the successor of Saul, and Judah in the south which David, at that time just an outlaw chieftain, had recently conquered (see Map 6: the kingdoms of Israel and Judah at MAPS). Ishbaal in the north seemed to have the better position, but seven and a half years after Saul died in battle, Ishbaal was murdered by a henchman of David. David denied responsibility for the murder, executed the man who had done it, then assumed the throne and became king. houses for personnel and villagers. Wisely, David did not slaughter the inhabitants when he captured the city. He absorbed them into the system. The wife who bore his successor, Solomon, may have been a Jebusite – her remarkable story is at Bathsheba of Jerusalem. Jerusalem from Solomon to Hezekiah. Click on map to enlarge. This is not a pretty, or indeed popular, period in Jerusalem’s history. When Solomon died the ten northern tribes broke away, forming the kingdom of Israel. Then in about 922 BC the Egyptian Pharaoh Sheshonk I led a raid, capturing the city and sacking it. The Temple was stripped of its treasures, including the Ark and the golden cherubim. About two hundred years later Hezekiah became king of Judah. He was a man of startling energy. 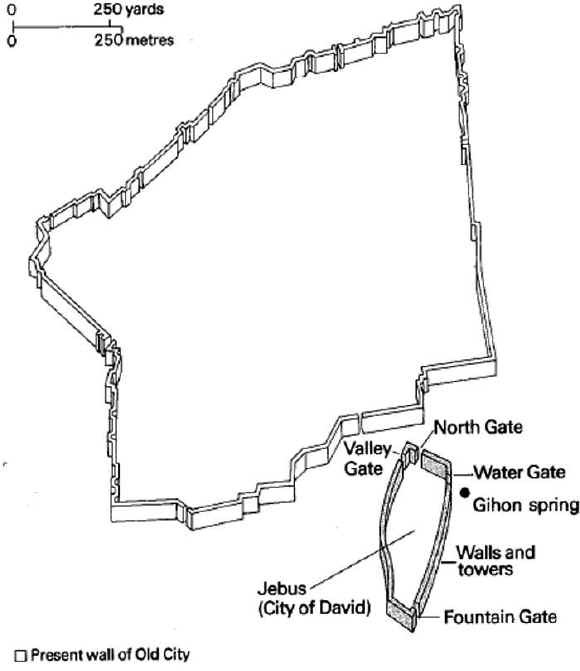 He built new fortifications and an underground tunnel in Jerusalem (see bottom right of map), bringing water from the Gihon Spring to the Pool of Siloam inside the city. Despite the new walls and the water supply, Hezekiah could not withstand real trouble when it came. In 701BC Sennacherib of Assyria ‘came down like a wolf on the fold’, extracting heavy tribute from Jerusalem. Eight years later Jerusalem was laid waste and its king deported to Babylon. Jerusalem survived, but only just. A few years later it was captured by Nebuchadnezzar II of Babylon, and this time the Temple itself was reduced to rubble. A large section of the Jewish population, including all the educated and wealthy people, was deported to Babylon. The long Exile began. Jerusalem after the Exile. Click on map to enlarge. What happened in Jerusalem after the Babylonian Exile? The Jewish population returned to their homeland, and to Jerusalem. Their city was a sorry sight, largely in ruins. Where once there had been a Temple, palaces, houses and commercial buildings, now there was rubble. Nothing remained except a few small buildings and a demoralized peasantry living in huts. But bit by bit, egged on by their leaders, the people began to rebuild Jerusalem. They were determined to re-establish their sacred city and in the following centuries Jerusalem grew even larger than it had been. 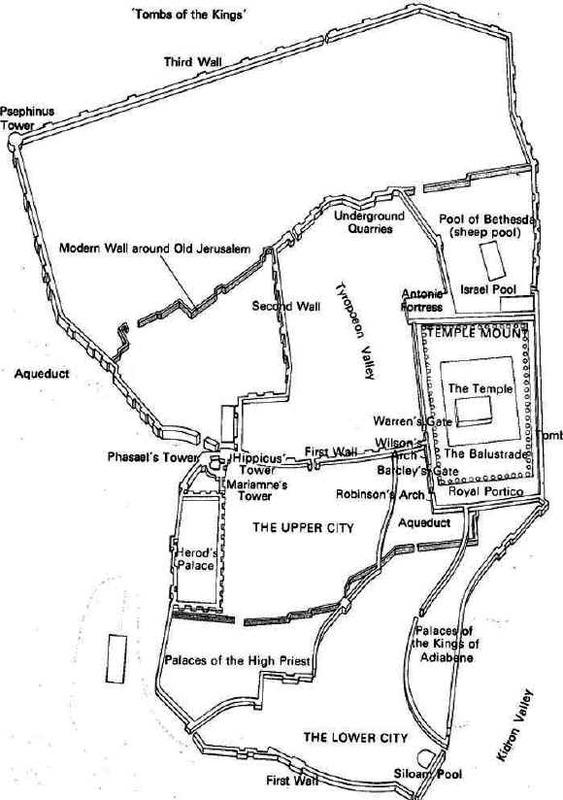 Jerusalem at the time of King Herod the Great. This was the period of Jerusalem’s greatest glory. 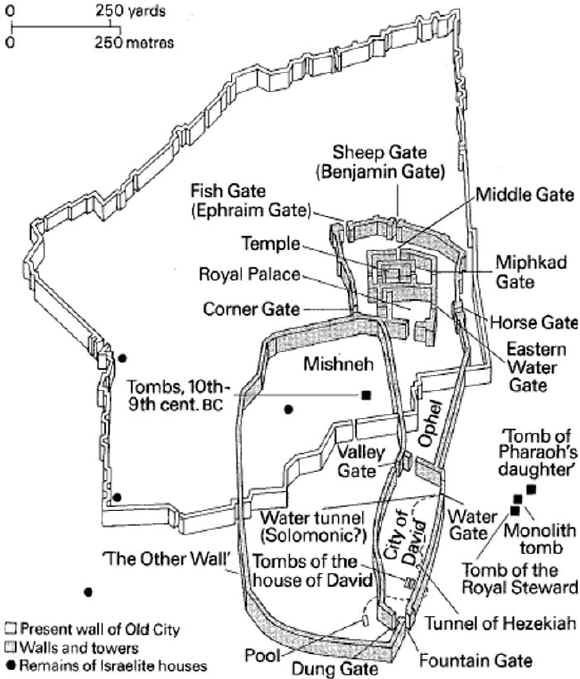 Compare the map immediately above with the ones further up the page, and you will see that Herod doubled the total area on which Jerusalem stood. He did this by building a vast stone platform, making the Temple area the largest sacred area in the world at that time – easily outdoing the Acropolis in Athens. Jerusalem and the country around it. Click on map to enlarge. 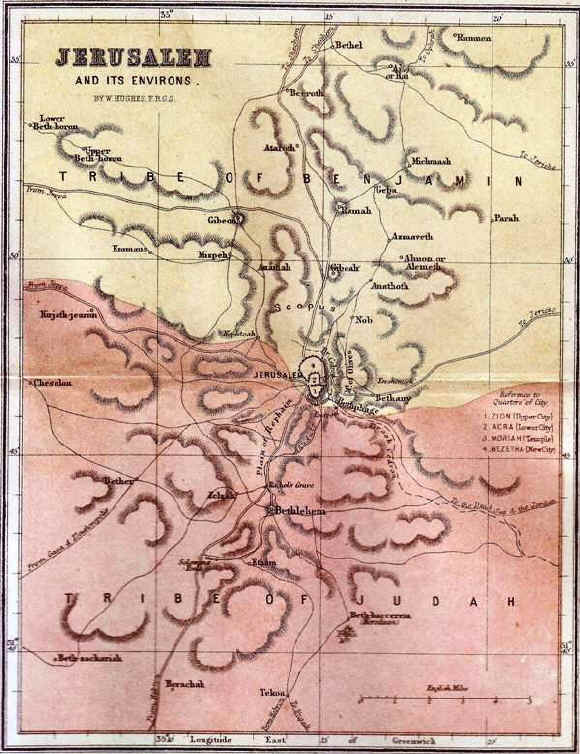 This topographic map shows how Jerusalem was built on rock and surrounded by rocky hills and valleys. The site was a natural fortress – no doubt that’s why King David chose it as his capital. Bethlehem: a small village, but only a few miles away from the capital (click on map to enlarge). Though it is a long way from Nazareth in Galilee, the pregnant but husbandless Mary may have been sent there, or to a nearby village, to visit her protective, shrewd cousin Elizabeth, whose husband was a priest of the Temple. Bethany, an easy walk across a valley to Jerusalem. It was in this village that Jesus spent time with his friends, the two sisters Mary and Martha, and their brother Lazarus. Emmaus, to the north-west of Jerusalem, where Jesus broke bread with the amazed disciples.